1.MCART™ Mobile Dental Treatment Cart is an all-in-one system offering all essential handpieces for small animal dentistry in a convenient, durable and versatile design. 2.It is also ideal for new or expanding practices because of its self-contained and easy mobility design. 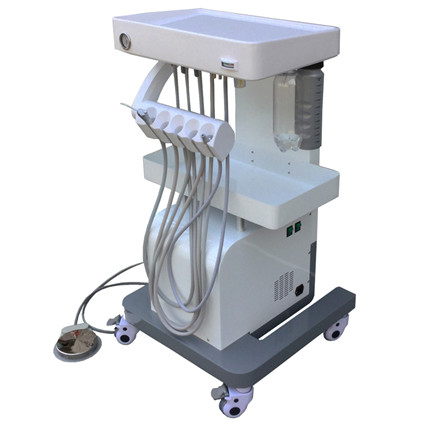 You can use it at work sites, nursing homes, hospitals--anywhere a mobile dental operatory or mobile dental unit is needed. 3.Many optional accessories make customizing for your needs simple. 4.Fully self-contained mobile operatory--includes compressor, handpiece controls, suction, and more. 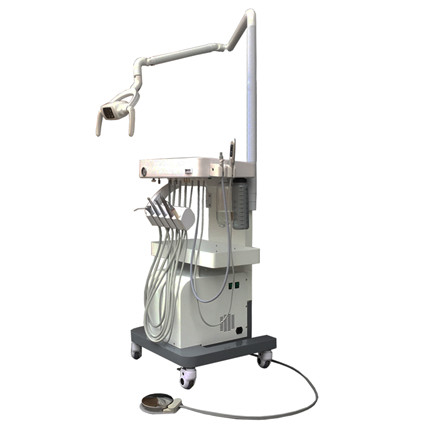 1.Fully self-contained ergonomic dental cart with built-in oil-free air compressor. 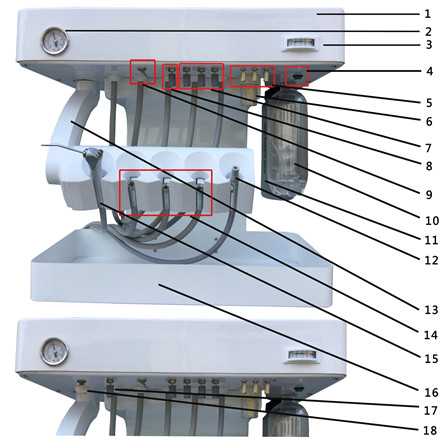 2.Two high speed air handpiece connections. 3.One low speed handpiece connection. 5.Electric suction with automatic overflow protection and solids trap. 7.One 1-liter bottle for irrigation. 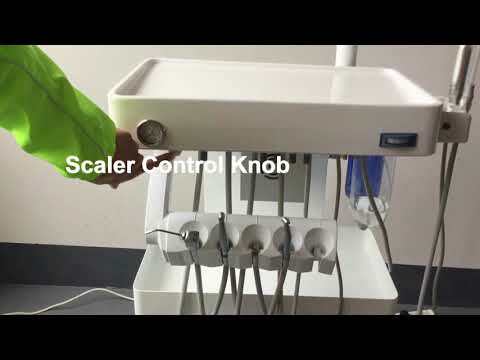 13.Handpiece water coolant on/off switch and adjustable flow control. 15.Durable powder coated frame and cabinet. 16.Built-in 8-liter stainless steel air tank. One unit, 4 different versions. 1.High speed hand piece hose 2 set. 2.Low speed hand piece hose 1 set. 3.Pure water bottle 1 set. 4.Waste water bottle 1 set. 5.3-way air/water syringe 1 set. 6.Suction system(saliva ejector) 1 set. 7.Built-in oil-free silent air compressor 1 set. 8.Built-in air tank 1 set . 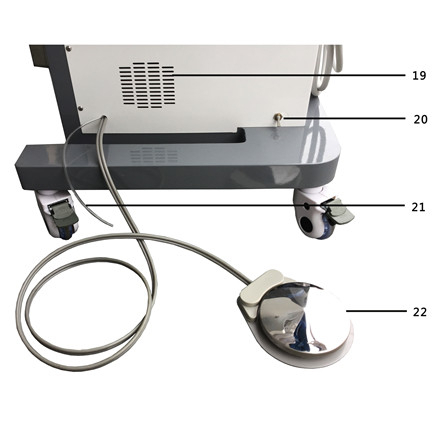 10.TR-ICS04 dental endoscope system(with wifi) set 1 set. 10.TR-960 operation lamp with arm 1 set. 11.TR-960 operation lamp with arm 1 set. 90° rotable instrument holder bar, Space-saving element for maximum freedom of movement. 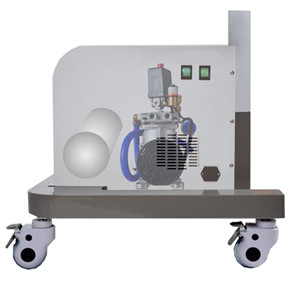 Build-in integrated mute oilless air compressor and 8 L stainless steel air tank. 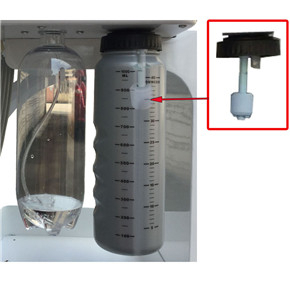 1000 ML sewage bottle,build-in float valve. When the sewage reaches 900ML, the S.E. will automatically stop working. Please turn off the S.E. switch before draining the bottle, otherwise the sewage will overflow. 1.The height from the upper tray to the floor is 41" (105CM). 2.The height from the upper tray to The lower tray is 16"(41CM). 3.The tray size is L 19"(50CM)*W 11"(30CM). The length of the cross arm is 27"(70CM). The length of the rocker arm is 23"(60CM). The height from the cross arm to the floor is 69"(177CM). 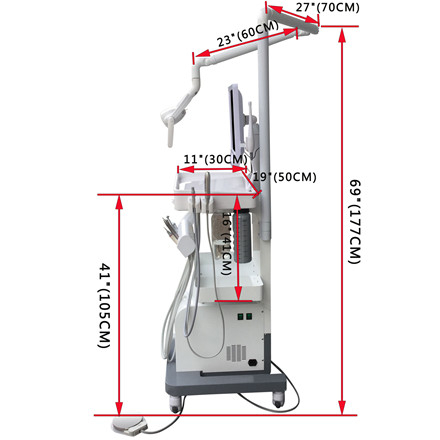 5.Shipping Package Gross Weight: 181 lbs(82KG). Q If the M700 can comes with hight speed CA motor type MC3 bien Air ? (RING red ) It's comes with lamp and saliva pump ? 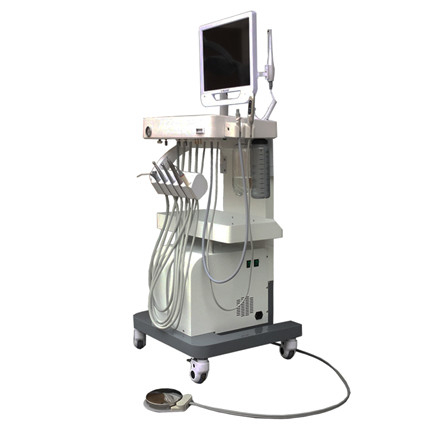 A The M700 unit have saliva pump already. And if the M700 add the electril motor (lile the C-PUMA-INT moeld ) into the unit, Then it can work with the 1:5 high speed Contra Angle. If do not add the electril motor , then can not work with the 1:5 high speed Contra Angle , Pls note. 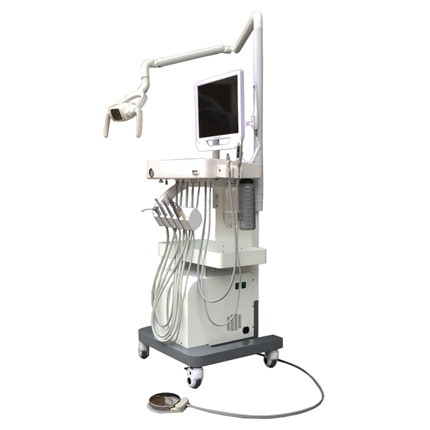 Q the machine include the air compress motor and air Tank? 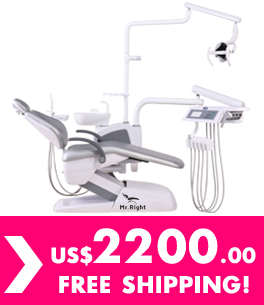 Q Can it come with other dental lamp? A Yes, it can. 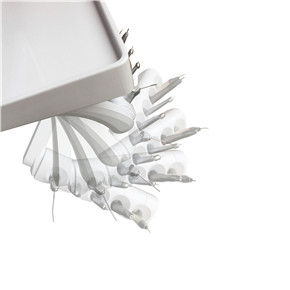 Please help to tell us the dental lamp model you need. Q If the machine with air compress motor and air Tank ? How big is the air Tank? 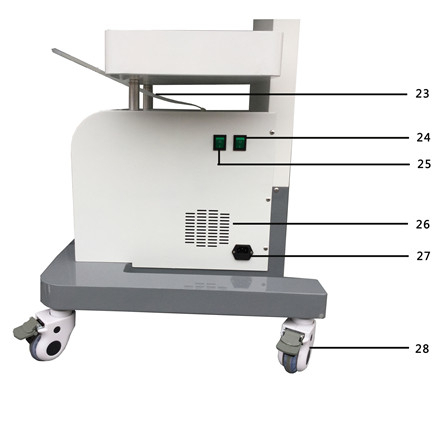 This mobile dental delivery unit cart very convenient and price is good. Exactly as described and received in perfect condition.